A gracious, charming hotel with all the ambience of old world deluxe style and service but imbued with all the most modern amenities artfully hidden from view. Apart from spoiling yourself with lassitude around the pool and Ligurian fodder, more lively activities abound. 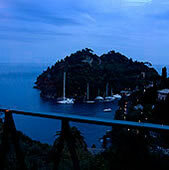 From the hotel, there are wonderful the walking paths of Mount Portofino. surrounded with flowers, rugged brush and wild herbs. A charming walkway above and away from the clogged coastal road leads down through the landscaped, terraced gardens of the hotel to the port with its cafes and shopping. Takes about 10 minutes unless you get distracted by the flora, views and want to just sit on one of the benches and just soak everything in. To return, if you don't feel like the uphill trek, a hotel shuttle runs every 20 minutes to bring you back up the hotel. 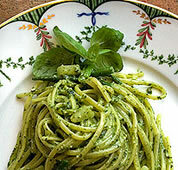 For those wanting to recreate their favorite dishes, cooking classes are available teaching how to prepare the healthy vegetable based dishes of Liguria. A wellness center offers treatments addressing both body and mind. Weather permitting, a lovely secluded garden bower provides a tranquil setting for outdoor massage. (Special treatments are available for both new mothers and mothers-to-be.) There are yoga and pilate lessons and personal trainers. With the sea at your feet, there is scuba diving, sailing, boat excursions with a sunset cruise and aperitifs off the coast of Portofino. For land lubbers, golf, tennis and horse riding are not far away. Excursions to Pisa and Lucca and Genoa on request. For those who want some time in the tranquil setting of the hill side location of the Splendido but also hanker for a little time surrounded by the bustle and life of the fishing village, Hotel Splendido has a sister hotel right on the port. The "Splendido Mare" is an adorable, small hotel with its own delicious trattoria looking out over the boats of the harbor. The Hotel Splendid is one of our favorite spots in Europe and definitely a must when in Italy.